If you’ve ever come especially early to one of our screenings, you may have seen this image on the screen: the black and white pattern of the Society of Motion Picture and Television Engineers‘s “RP 40” test loop that we use to set the 35mm projector’s focus and framing. We’d like to recommend a film for the Registry. The title is 35mm Projector Alignment and Image Quality Test Film (Society of Motion Picture and Television Engineers, 1971/1995, silent, 00:02:13 or loop). 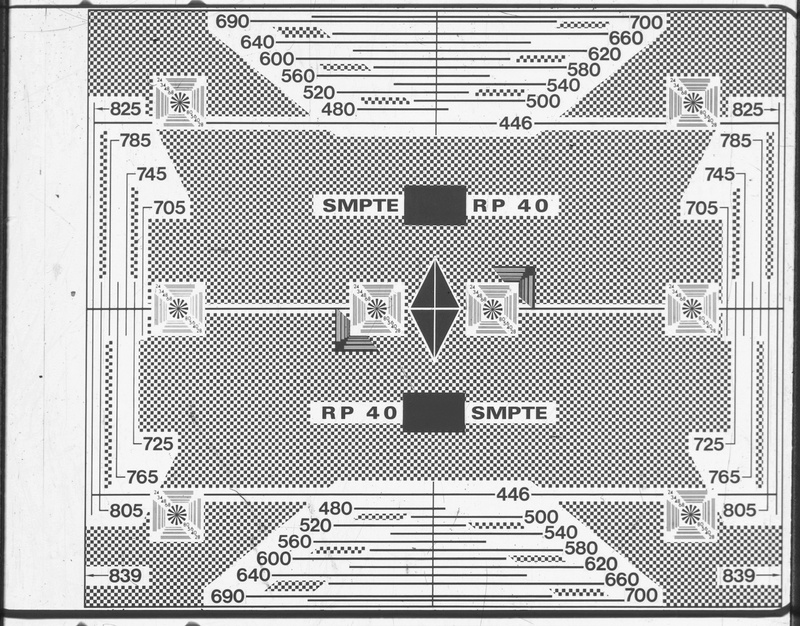 It’s colloquially referred to as RP 40, which is the SMPTE standard that describes the construction and use of the film. Though it might be a well known film to you, we’ve included a still from the 1971 version of the film for your reference. 35mm Projector Alignment and Image Quality Test Film was created by SMPTE to, according to the standard’s documentation, “reproduce motion pictures to make faithful and pleasing reproductions of images and sound.” There’s only one image in the film. Its unchanging nature makes it a powerful tool to discover and fix issues that can be obscured during regular projection. RP 40’s seemingly abstract squares and lines become markers by which to set image focus, check the image resolution, adjust the projector’s shutter to remove travel ghost, and create plates for different aspect ratios. Why recommend RP 40, which is clearly not an aesthetic work and doesn’t document an important social event? The film was part of the everyday operations of a movie theater. In this way it can be seen as part of the sub-genre of functional films for cinema operation alongside snipes like 1953’s Let’s All Go to the Lobby. It’s arguably one of the most common and most regularly projected American films of the last 40 years. Every projection booth worth its salt had one. Repertory and archival theaters still projecting film use it daily to ensure the highest standards of projection. The RP 40 test film is a medium-specific use of film technology. It’s entirely about cinema as a projected art form. It exemplifies the practices and technologies that regulate the moviegoing experience. 35mm Projector Alignment and Image Quality Test Film is a calibration film recognized by projectionists and lab technicians everywhere. With the ending of film projecting in mainstream cinemas, adding RP 40 to the Registry is a way to honor the behind-the-scenes labor of projectionists as an occupation and skill that was central to twentieth century theatrical cinema.